A christening party is a special occasion for family and friends to come together. There's no better way to thank your guests for sharing an important day with you than handing out lovely christening favors at the end of the party. These special favors offer a great way to let your guests know that you appreciate the time they have taken out of their busy schedules to mark this special event with you. They also offer a wonderful way to create lasting memories you will all cherish for years to come. 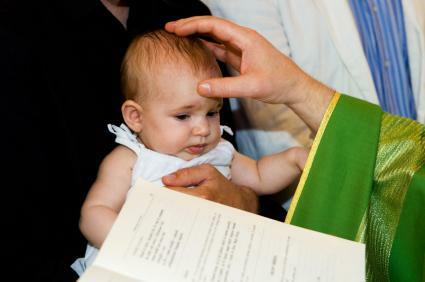 What Makes a Good Christening Favor? Christening favors should have a personal touch, but they don't have to cost an arm and a leg. They should be a token of your appreciation and a remembrance of the christening itself. As such, favors that appear to come from the heart are much more valuable than favors that appear to come from an expensive store. Many people even make their own favors rather than buying them to express their personal gratitude to their guests even more fully. As a general rule of thumb, christening favors should be a little more serious and classic than favors you might choose for another kind of party. That doesn't mean the gifts have to be staid - simply remember that a christening is a happy, yet religious event. The same favors won't suit the mood as those that would be more appropriate for a bachelor party. Keep your recipients in mind when choosing favors. Now that you have the general guidelines down, you just need a few ideas to get you going. Consider the following favor favorites to get the brainstorming underway. Most Christian stores offer bulk sales on christening favors, and you can also find many online resources that offer special prices for bulk orders. Whether you choose a religious or non-religious option for your christening favor, a great way to make the gift even more special is to personalize it. You can get everything from personalized candy bars and breath mints, to personalized prayer cards and candles. Personalize the favors with your guests' names or your child's name, plus the date and place of the event. However you celebrate this special occasion, favors can add to the festivities by providing mementos for all who attend. Whether you purchase them or make them yourself, they should reflect your personal beliefs and style. Be sure to save a favor or two, and place it in your baby's scrapbook or memory book. It will stand as a pleasant keepsake of a time he or she was too young to remember.